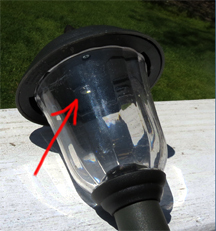 We just did a post about a solar lantern that wasn’t working as it should be. And, there was a quick fix to that problem and the lantern works as great as ever. Unfortunately, not all solar lights can be saved. Even more unfortunately, there are a lot of lights that frankly are a waste of money. 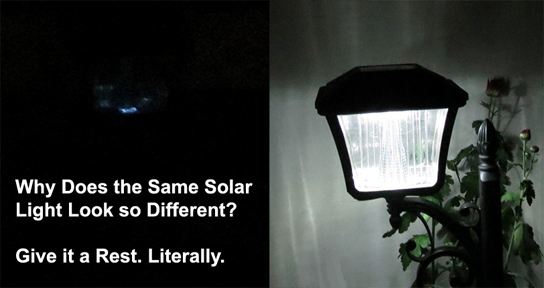 We can’t say it often enough: with solar lighting, you usually get what you pay for. It’s kind of hard to see in this picture, but even though it’s daytime, this solar light is on. In fact, the only time it works is in the daytime. Even the best solar lights can get tired. Our Plantern (half planter, half solar lantern) was a bright and attractive addition to our deck this summer. But, the other day I noticed the light quality was GAWD-awful. Luckily, it was an easy fix. Find out what happened and how easy it was to get it back to it’s normal self. Fire Pits Add Warmth to Outdoor Gatherings, But Safety First. With so many different types of fire pits available with a broad range of features and prices, there’s bound to be one that’s perfect for you. Find out what to look for and compare when making your purchase decision, what fire pits may be dangerous (even recalled) and still are for sale online, and basic fire pit safety with this post.